What Does the Website Include? What is the Scientist in the Classroom Program? The National Center for Ecological Analysis and Synthesis (NCEAS) promotes education and outreach as part of its mission to increase the public understanding of science. 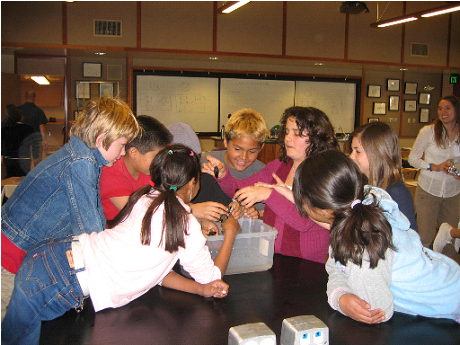 NCEAS developed Kids Do Ecology (KDE) in 1997 as the primary component of its outreach to grade school students. Kids do Ecology includes both this Website and a Scientist in the Classroom Program. The original focus of the KDE program was the development of the web site to teach elementary school students about ecology, experiments, and use of data. The KDE web is frequently reviewed and recommended, and continues to be heavily used in the United States and abroad. School and library web sites, teachers' organizations, scientific organizations, and many other institutions link to it from their web sites. In order to expand the reach of the site and address the needs of Spanish speaking children here in Santa Barbara, as well as nationally, a Spanish language version of the site is available. Learn About Ecology introduces the study of ecology, describes careers in ecology, provides interviews with ecologists, gives an overview of the Kids do Ecology Program and website, provides links to additional resources, and answers to frequently asked questions. Endangered Species provides information and resources on endangered and threatened species. The Data and Science Pages provide fun descriptions and activities for "young scientists" to learn about the scientific method, especially collecting and displaying data. World Biomes provides details on regions of the world with similar climate and vegetation. Crossoword puzzles and other word games are part of the fun of learning. Classroom Projects describes KDE'S Scientist in the Classroom Program in Santa Barbara. It includes class web pages, summaries of experiments, and photos of posters and presentations. The Marine Mammal Pages provide overviews on a variety of local marine mammals, and provides data on marine mammal sightings gathered by local grade school students. Ecolinks has lots more web resources for students! For Teachers <discusses how to participate in KDE and provides links to additional resources for teachers. The Santa Barbara Classroom Program of KDE provides an inquiry-based approach to science that is fun and meaningful and can be replicated at other schools. NCEAS ecologists and teachers in Santa Barbara schools work with 5th grade classes to design and conduct scientific experiments in ecology. Students learn the scientific method by doing it, from experimental design and hypothesis, data gathering and analysis, to reporting results and conclusions. Each class has its own page on the web site to feature the poster they prepare to describe their project and provide results. At the conclusion of the experiments a poster session is held at NCEAS for staff, scientists, teachers, parents and students. Each class presents its experiment to the group. Careers: Scientists also talk with students about what ecologists do, how they became interested in becoming ecologists, and how students can train for a career in ecology. Articles on this topic are included on the web site. NCEAS was initially a partner with Los Marineros, a marine education program which for many years provided a core curriculum for 5th grade classes in the Santa Barbara School District. Los Marineros was initiated by the Channel Islands Marine Sanctuary and managed by the Santa Barbara Museum of Natural History. 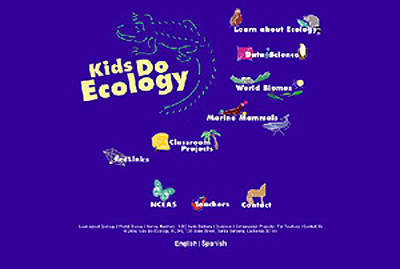 Kids do Ecology is now offered directly by NCEAS. KDE has served almost 2000 students in Santa Barbara since its inception in 1997. The KDE classroom experience has been productive and very popular with local teachers and students and with NCEAS scientists.